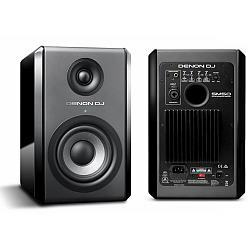 I took a bit of a leap of faith with these monitors as there were no reviews to be found at the time of purchase. The brief description, given in a video at the 2016 namm show, made me curious when the presenter mentioned that they had controls to flatten the response as well as being able adjust the range for playback. I can confirm that they do both very well. When set flat, all my go-to patches on my fx box sound as they should with no colouring. In fact I was able to improve a few. For fun, I pulled up one of those synth pad apps on my phone to see how the electronic drums, bass drops and other fx would sound...exactly as you would hear it on a recorded track. The vocal samples, and vocals in general, really stand out in flat mode. I don't record vocals but I can see how this would be helpfull for getting them right in the mix. I think the better half of these speakers is in how they sound for playback. The frequency adjustments at the back are very effective and completely change the behavior of these monitors. I first tried them out with some random ambient flac/24bit files and the hair literally stood up on my arms and neck. There's just so much separation and clarity in how each instrument is represented...a totally new experience for me. I compare it to when I first got a 4k tv...super hd for your ears. The mids and highs reveal every little nuance to the point where you can hear the finger sliding and pick attack on guitars. The lows are punchy and acurate...not at all flubby. They remain tight at threshold volumes but the bass does roll off somewhat with lower notes, likely due to the limits of a driver that size. I don't think a sub is necessary (unless that's your thing)...especially at moderate volumes. It's worth mentioning that I have these separated about 5 feet, triangulated back, just beyond my chair as to not have them cross, right at head height. I'm using the balanced trs inputs, coming from the balanced output from my dac. I find that they have more than enough power...much more than what's needed for comfortable listening levels. I also found that they sound better away from the wall, especially at higher levels. I have sat in front of these for 2-3 hours at moderate levels and honestly never experienced any ear fatigue, which is something I can't even do with an expensive set of over-the-ear cans. Another important factor that led me to purchase these monitors was the finish and build quality. I'm all about functionality, but I love things that look as good as they sound. The 2 other most popular monitors in this class, that I have experience with, don't even compare. The mini toggle switches on the back are like the ones on my boutique amps. There's lots of satisfying clicks from these switches, placed conveniently at the top of the back panel so they're easliy adjusted while still being able to listen to the affect they have on the sound. The cabinets appear to have an inner graphite coloured body, capped on the sides with two black mirror-like panels. I'm not sure what they're made of but they have a good weight and resonance to them. These vs the competition is like comparing the surface of a grand piano to an IKEA kitchen counter top. I was almost sold on looks alone. I can honestly say that these are the best bang for buck in this catagory. One thing that Denon does that most others don't that makes these monitors an even better value...they included a set of isolation pads. Something that could easily set you back another $50! Definitely a nice surprise! 5 out of 5 stars...highly recommended!